PODS® isn’t the “other” guy, it’s the man! Look at this picture. Sad isn’t it? I mean, all of those personal belongings and treasured keepsakes being slammed together every time the box unit tilts forward or backwards on the flatbed trailer. It’s like a carnival ride gone bad with your stuff inside paying the price for eating too many funnel cakes. I can’t even look at it without feeling queasy. Neither should you. Look away before your retinas are damaged! Now, remove the bandages, open your eyes and call PODS Moving and Storage. 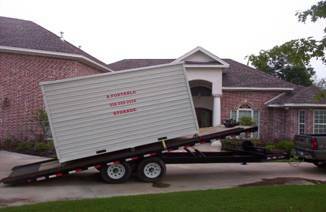 When you pack your boxes, furniture and appliances they will be in the exact same spot when the PODS® container is re-delivered to your new home. Nothing will shift, tilt or go on Mr. Toad’s Wild Ride because PODS’ patented truck lift system called PODzilla™ will carefully balance your cargo every step of the way. So, I ask: Why would you use the “other” guy when PODS is clearly the “man” for the job?